The owner of the state’s largest newspaper is facing a lawsuit from a former top editor and business partner. Tony Hopfinger, who headed the Alaska Dispatch News until last year, alleges publisher Alice Rogoff has failed to pay him what he’s owed. The lawsuit hinges on differing interpretations of a million-dollar contract signed on a cocktail napkin. Hopfinger is suing over two distinct but related issues. “The big issue here is she still owes $900,000 and she didn’t make the payment, so she breached the contract,” Hopfinger said by phone Friday from his father’s house in Chicago. That “contract” is scribbled on a bar napkin — although Hopfinger says it actually came from a coffee table in a lawyer’s office. 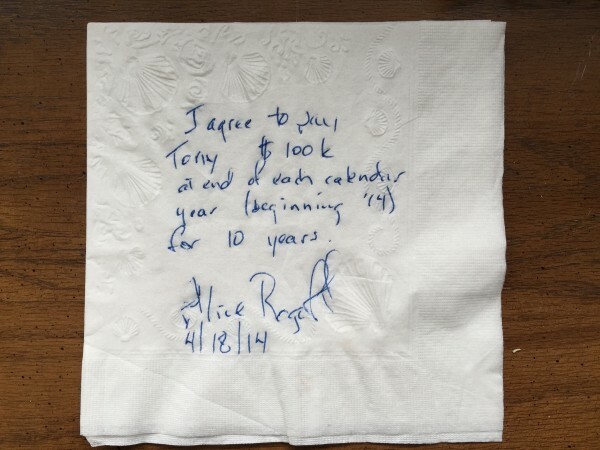 With a blue pen, Rogoff wrote, “I agree to pay Tony $100K at end (sic) of each calendar year (beginning ’14) for 10 years.” The napkin is dated April 18, 2014. At the time, Hopfinger and Rogoff were partners in a startup news site, the Alaska Dispatch, which was preparing to buy the Anchorage Daily News for $34 million from the McClatchy Company. That merger created the media company Alaska Dispatch News. According to the complaint filed Wednesday in Anchorage, Hopfinger began having doubts about the acquisition shortly after he and Rogoff first entered talks with McClatchy in September 2013. Hopfinger worried about the “dying print industry” and had reservations about Rogoff’s plan to pursue new investors — including some he thought could bring conflicts of interest, like Anchorage developer John Rubini or McKinley Capital Management founder Robert Gillam. The two men have traded spots as the wealthiest residents in the state. “I don’t know if she had serious discussions with these individuals, but it made me uncomfortable to co-own with those folks,” Hopfinger said. He asked to be bought out of his small ownership interest, and Rogoff verbally agreed, according to the complaint. As weeks went on, no document spelling out the million dollar deal ever materialized — until the napkin. What the million dollars actually bought is what’s under dispute. Hopfinger says it’s what he was owed for his share of the company. Rogoff’s lawyer says it was essentially a bonus, on top of his salary as editor of the new ADN. Hopfinger had a separate employment contract. It detailed his $190,000-a-year salary, duties, and conditions of release for a term of five years. According to the complaint, he was paid the first $100,000 installment from the napkin agreement January 1, 2015. But less than a year later, Rogoff’s lawyer told him there wouldn’t be any more payments coming. That led to an argument in a parking lot in December. The two sides don’t agree when exactly Hopfinger and ADN parted ways. It’s nebulous how much he was actually involved in the paper at that point: months earlier he’d relocated to Chicago to take care of his brother and terminally ill mother. By the time of the December argument, he had remarried and appeared to have moved his life out of Alaska. “Hopfinger did not live up to his promises and has remarried and permanently relocated to Chicago with no apparent plans to return or to provide support to the Alaska Dispatch News,” the statement continues, arguing that because Hopfinger broke his employment contract, it nullified his loyalty to the business. Even if the court does see a buyout instead of a bonus, it’s not clear what company Hopfinger was actually selling a share of. He’s listed in business records as a 5 percent owner of a limited liability company called Alaska Dispatch Publishing. But he has zero shares in a separate LLC called AK Publishing, a company owned entirely by Rogoff, and set up “unbeknownst to Hopfinger” (according to the complaint) six weeks before the merger. That means if the court decides to follow the letter of the business license over the spirit of the cocktail napkin, Hopfinger may be entitled to 5 percent of a company that no longer holds any assets.